Welcome to Tiger-Rock Martial Arts of Oak Hill! We offer martial arts, self-defense classes, and taekwondo classes in Oak Hill for ages 4 to adult. Tiger-Rock Taekwondo is a perfect activity that blends the advantages of both art and athletics. Better yet, Tiger-Rock Martial Arts provides participants with an equal opportunity to advance their skills since no one ever sits on the bench! Learn more about our kid’s program! Are you an adult needing to get in shape? Do you want to gain self-defense skills that will improve your self-image? Do you want to challenge yourself to learn something new and gain self-confidence that will benefit you on your job? Do you want to learn how to improve your diet and lifestyle for optimum health? Tiger-Rock takes the martial arts experience to a new level. Our programs focus on the components that increase fitness, artistic precision, and self-empowerment! Did you know that taekwondo is the world’s most popular martial arts form? There’s a reason why taekwondo is popular – so popular that it is one of the only two martial arts forms with competitive events at the Summer Olympics! Taekwondo, which is Korean for “the way of the foot and the fist” is a martial arts form, physical fitness program, and self-defense system in one! Taekwondo forms the basis of all Tiger-Rock martial arts training. Our Oak Hill taekwondo lessons will help you improve your physical health as well as teach you important self-defense tactics. Tiger-Rock Martial Arts of Oak Hill is a martial arts academy located at 5501 W US Hwy 290 Service Rd Suite C, Austin, TX 78735. We’re right on the corner of US 290 and Monterrey Oaks Boulevard. We specialize in taekwondo training, self-defense training, and anti-bullying education. Our academy is part of the larger Tiger-Rock Martial Arts International, an organization with over 150 locations from coast to coast. 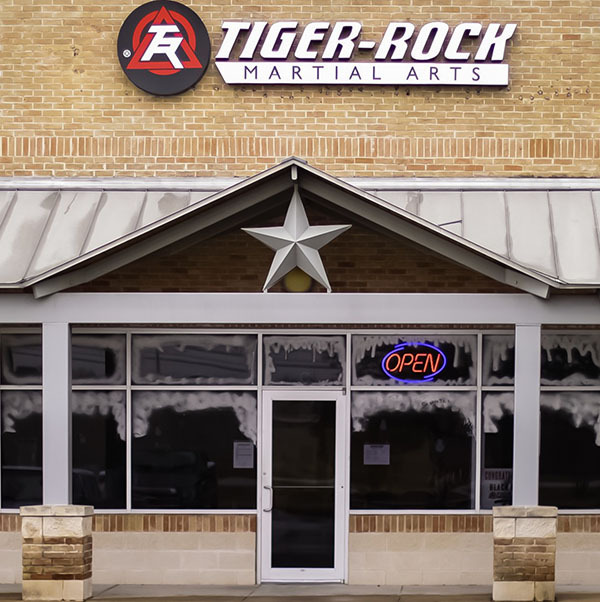 Since 1983, Tiger-Rock Martial Arts has been a leader in martial arts training. We teach our martial arts and Taekwondo students in Oak Hill the value of citizenship, leadership, humility, courtesy, respect, and honor. Tiger-Rock Martial Arts of Oak Hill features kids and adult martial arts programs. Our kids’ martial arts programs are divided into three age groups – one for preschool and kindergarten, one for elementary students, and one for middle school, intermediate school, and high school students. We hold classes every afternoon six days a week. We also hold morning classes on Saturdays. Our martial arts, taekwondo, and self-defense classes in Oak Hill make for an incredible workout. Classes last anywhere from 30 (preschool students) to 45 minutes (adult students). Our kicking, striking, and agility drills is a perfect way to release stress and enjoy a refreshing physical activity. Tiger-Rock Martial Arts features a staff of annually certified instructors dedicated to your transformation. With their instruction, you will experience a physical and mental boost. Martial arts training can help you become more fit and more focused. You will achieve new levels of physical fitness. You will enhance your mental keenness. Our R15E Program is our initiative to help new martial arts students reach their goal from transforming from a white belt to a black belt. This program will not only help you become a champion on the mat, but also a champion in life. This program is very challenging, but also very rewarding. You will amaze yourself with what you will accomplish as you advance through our signature program. Your neighborhood martial arts academy here in Oak Hill and Southwest Austin TX is the perfect place to complete your transformation. We provide a martial arts training experience that is unlike anything any other martial arts academy can offer. At Tiger-Rock’s martial arts self-defense classes in Oak Hill, you participate in an environment with talented instructors and like-minded peers. Our academy instills the value of personal achievement and the competitive spirit. Our Certified Taekwondo Instructors are active martial arts trainees. They learn the latest developments in taekwondo and physical fitness as an evolutionary process. They pass on those lessons to you the student, helping you become more effective in your self-defense and martial arts training! Start training today in Taekwondo and self-defense at our Tiger-Rock Martial Arts Academy in Oak Hill. Call 512-731-5425 or email us at oakhilltkd@gmail.com for more information!